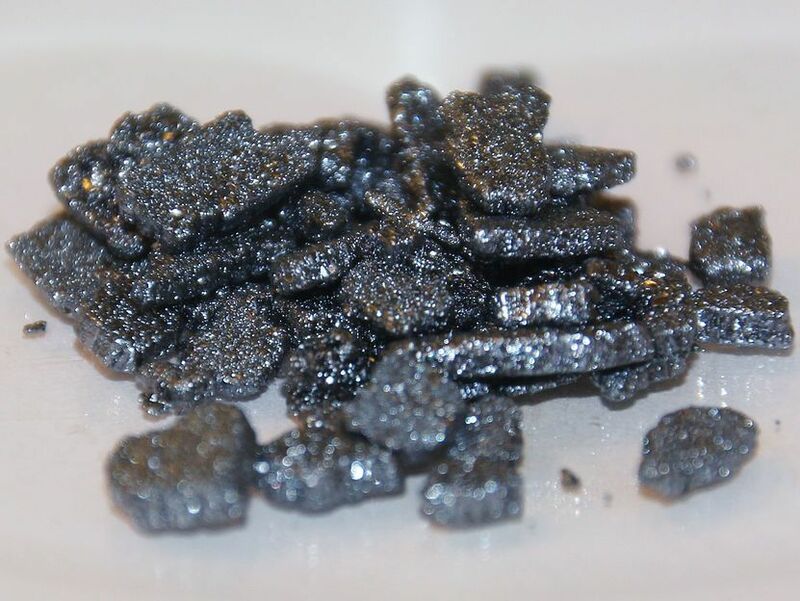 Iodine is a non-metallic, dark-gray or bluish-black, lustrous solid element. 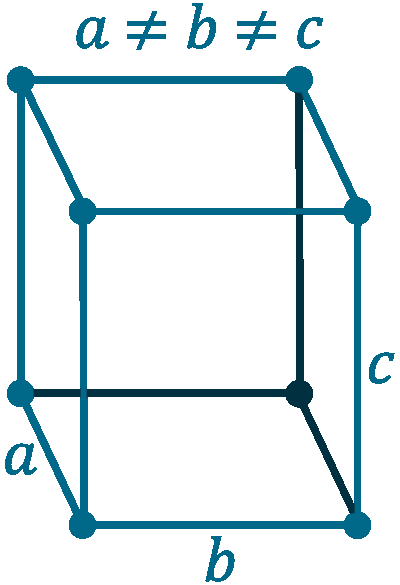 It forms compounds with many elements, but least reactive than the other halogens. 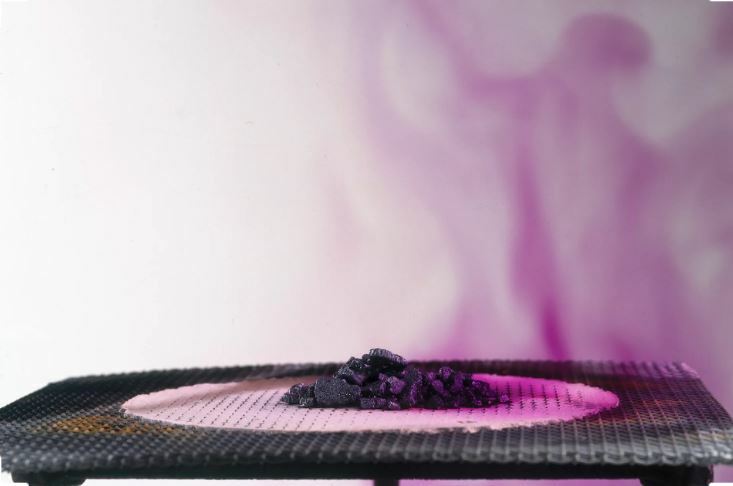 Iodine sublime (change directly into vapour when heated) easily on heating to give a purple colour. Iodine dissolves readily in some solvent, such as carbon tetrachloride (CCl4), chloroform (CHCl3), or carbon disulfide (CS2) to form beautiful purple solutions, and slightly soluble in water. Reacts with chlorine in the presence of water to form iodic acid. Iodine compounds are important in organic chemistry and useful in medical treatment as iodine tincture (It is a solution of KI and iodine in alcohol is used as antiseptic for external wounds) and iodoform. Other uses are in printing inks and dyes, catalysts, animal feed supplements and photographic chemicals (Potassium iodide (KI) is used in photography). It is also used to make polarizing filters for LCD displays. Iodine is very essential for humans, daily intake need of about 0.1 milligrams of iodide. Human body contains iodine up to 20 milligrams, mainly in thyroid gland. This gland helps to regulate growth, the nervous system and the metabolism. Normally we get enough iodine from the food we eat. Due to shortage of iodine in human body, the function of the thyroid gland will slow down and that gland will start swelling up. This phenomenon is called struma. Large quantity of iodine can be dangerous for human body, because the thyroid gland will work too hastily that affects the entire body, It causes loss of weight and disturbed heartbeats. I2 is toxic, and its vapour irritates the eyes and lungs, even all iodides are toxic if it taken in excess. 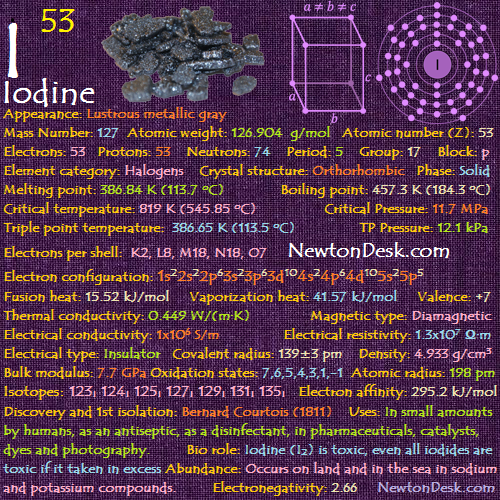 Iodine 131 is a radionuclides (radioactive isotope) that increases the risk of cancer and possibly other diseases caused by thyroid hormonal deficiency. 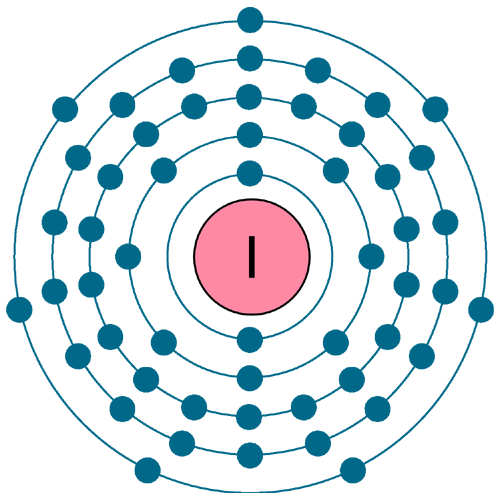 Iodine is found in seawater in form of iodide, present 0.05 parts per million. Iodine obtained from seaweeds in the past. It is obtained by releasing iodine from iodate which is obtained from nitrate ores or extracting iodine vapour from the processed brine. Ultrapure iodine can be obtained from the reaction of potassium iodide (KI) with copper sulfate (CuSO4). Annual world wide production of iodine is around 12,000 tons.